Early in the second half of the twentieth century, extruded aluminium windows were introduced to the United Kingdom, some say from Canada, some from Scandinavia. Either way it was the start of a revolution in the design of composite windows for the UK which had predominantly only hardwood or softwood frames to choose from prior to this. Initially the aluminium frames were fixed directly to the brickwork but it soon became apparent that aluminium windows and doors performed more efficiently if they were installed in a timber sub-frame prior to installation – and composite windows were born. Today aluminium windows in timber sub-frames are still offered to the domestic market but they have mostly been replaced by PVCu frames in popularity. Aluminium composite windows and doors are more common in the commercial market and are used widely for shop fronts, offices and other commercial premises. The ease, with which aluminium can be painted practically any colour, also makes them entirely suitable for companies wanting their fenestration in branded company colours. Aluminium composite windows and doors are still available for domestic properties but are more expensive than PVCu windows and doors due to the method of manufacture, longer installation time and lower manufacturing quantities. Advancements have been made however and modern aluminium windows and doors tend to have thermal breaks so that the inner surface is not as cold as the outer surface – hence reducing condensation on the inside of the frames. They also tend to be powder coated to various different colours, rather than having a plain aluminium appearance. Specialist manufacturers have also come up with variations on this theme with some companies offering windows which include virtually maintenance-free aluminium on the outside and timber for its aesthetic qualities on the inside. Ever since the first white PVCu window was manufactured and installed, companies have strived to make a PVCu window look like a timber one. To achieve this, woodgrain effect foils were produced which attempted to replicate the appearance of various types of timber. These foils were bonded onto the surface of the PVCu extrusions prior to fabrication, either onto both sides of the frame or just on the outside. The early versions of woodgrain effect PVCu windows and doors attempted to provide the appearance of mahogany, though with little success as they were not UV stable and the frames tended to fade or discolour over time. Foils with UV filters were produced to prevent discolouration but the poor interpretation of real mahogany remained. With advancements in technology, more realistic woodgrain foils were produced and now versions of rosewood, oak and other types of timber began to appear. They also had a definite grained feel to the surface, rather than having a flat, unrealistic appearance. Nevertheless, although these new foils were more realistic interpretations of the various types of timber, manufacturing processes of PVCu windows ensured that they still didn’t have the look of genuine hardwood. One reason for this is that when PVCu windows and doors are fabricated, the frames have diagonal welds in the corners and at the intersection of transoms and mullions. These are a distinct giveaway for a PVCu window frame masquerading as a hardwood one. Although little could be done about the manufacturing processes of PVCu windows to improve the situation, companies also recognised that sometimes real hardwood windows were painted rather than stained. This led to foiled profiles for PVCu windows and doors in traditional colours such as cream, pale green, grey and black – all with a ‘grained feel’ to the frames. Visitors to this website will hopefully realise we have gone to great lengths to remain independent and show no favour to one manufacturer over another. But every rule has an exception and this is a very worthy exception. The Beaumont™ window is still made from PVCu extrusions and is finished with a woodgrain style foil bonded to the surface in a similar way that other wood-effect PVCu windows are, but the similarities end there. With a unique manufacturing process, the Beaumont window is a composite window which is fabricated in the same way that a timber window would be put together. It has an innovative sash corner system and hand scribed joints for all intersections of the transoms and mullions. (Transoms are horizontal sections of profile within a window frame whilst mullions are vertical). The Beaumont™ composite window is seriously one of the most genuine PVCu interpretations of a hardwood window we have seen. Beaumont™ composite windows are only available with a grained, foiled surface and is manufactured in the following colours. Painted – white, cream, chartwell green, anthracite grey and black. Stained – rosewood, golden oak, nut tree and Irish oak. It is also only available with dummy sashes which from outside look as though even the fixed sections open. This creates a window where all the glass panes line up to give equal sight lines. The Beaumont™ window is also fitted with astragal bars and although modern secure locking systems and handles are available, to add to the authenticity Beaumont™ composite windows, a range of traditional ironmongery is also offered, including Monkey-tail handles and casement stays. 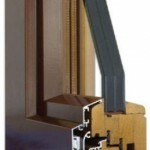 As if the unique appearance of the Beaumont™ composite window weren’t enough, needless to say it is also ‘A’ rated window for thermal efficiency.